A nineteenth century steel ice or sugar cleaver. This piece is relatively simple in form, as many confectioners cleavers were very ornate shapes, but it is still quite interesting. The handle is wooden, with a combination of brass and copper fittings, and the piece is well made. It dates from c.1870. 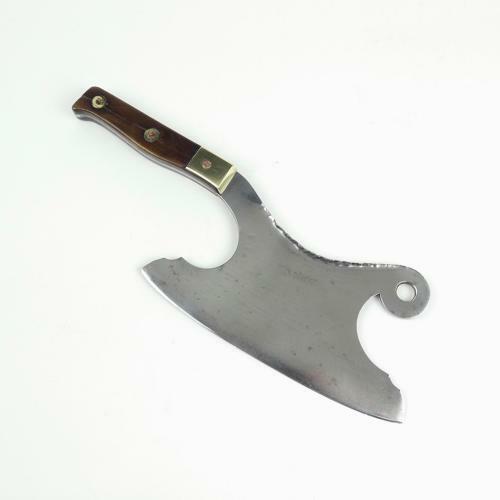 The top of the blade has been used for hitting something, as the steel is slightly mis-shapen, and there is very slight pitting to the steel. There are a couple off fine cracks in the wooden handle. This is all quite minimal and the piece is generally in very good condition.